Eileen Christelow started her Five Little Monkeys empire by adapting the traditional fingerplay “Five Little Monkeys Jumping on the Bed” into a delightful picture book in 1989. Many five little monkeys picture books have followed and they all feature the same adorable and mischievous little monkeys and their harried mama having adventures. In the most recent addition to the Five Little Monkeys series, the monkeys trick-or-treat. The story starts with the monkeys getting their costumes on as their favorite babysitter Lulu arrives to take them trick-or-treating. As they leave, Mama reminds Lulu that on this special night, she does not have five little monkey monkeys, but a banana, alien, ghost, goblin, and princess and that she should not “lose the rascals.” The little monkeys, being as roguish as ever; decide to trade costumes with friends that they meet along the way. Poor Lulu does not notice the monkeys are switching costumes with other trick-or-treaters since the costumes conceal the true identity of the person wearing them. Lulu leads the banana, alien, ghost, goblin, and princess who are not the five little monkeys back to the monkeys’ house, and the five little monkeys follow. Mama lets the disguised animals in her home pretending not to notice that they are not her children. The little monkeys panic as mama does not seem to recognize that the animals in her monkeys’ costumes are not her five little monkeys. At the last minute mama hugs her little monkeys and scolds them for tricking their babysitter. Then, the monkeys enjoy a treat with Lulu, the friends they traded costumes with and mama. Filled with Halloween fun, the book also includes recipes for Lulu’s Eyeball Cookies and Worm Juice. This month, Eileen shares a very Halloween-appropriate book: The Zombie Makers by Rebecca L. Johnson. I came to The Grand Plan to Fix Everything backwards. I happened to grab Uma Krishnaswami’s newer book, The Problem with Being Slightly Heroic, off the shelf, and, just planning to flip through it, ended up reading the entire thing. Then, of course, I immediately had to go back and read the first book in the series. Dini and her friend Maddie love Dolly Singh movies–the dancing and the singing and the fabulous plots are just sooooo . . . ! They have big plans to spend the summer at Bollywood dance camp so that they can dance like Dolly, but Dini’s mother throws a big wrench into their plans: Dini’s family will be moving to India for two whole years, so Dini’s mother can work at a medical clinic in the tiny town of Swapnagiri. Dini will have to leave Maddie, dance camp, and her whole regular life in Maryland to go live in the middle of nowhere: Swapnagiri isn’t even anywhere near Bombay! The only thing that can save Dini’s year is if she could meet Dolly Singh–but how can she find one movie star in a country the size of India? Well, it might be a little easier than she thinks. . . . This book is completely adorable. Not only will the reader be captivated by Dini, but they’ll love all the people she meets, from Soli Dustup the movie producer, to Lal the humble postman, not to mention the monkeys and the goats! And I was completely surprised by one thing: I usually cannot stand books written in present tense. I find that it usually knocks me completely out of the story and seems very affected. In this case, I didn’t even notice until I was halfway through the second book that it was written in present tense. I had to flip back to the first one to see if it was written that way as well, and of course it was! The book is constructed so well that the present tense narration is an integral part of the feeling of the book. In combination with that present tense, the plot, zany as it is realistic, sweeps the reader along with propulsive motion. I highly recommend this book to anyone who loves fun, mad-cap, realistic fiction. Its length means that it is usually recommended for grades 4 and up, but I think it would also work well as a read-aloud for younger children (provided that the reader doesn’t mind the occasional Hindi word! My only complaint? It doesn’t come with a soundtrack! Unlike other years however, when next year, 2014, rolls around, Cubs fans—and all Chicagoans—will finally, actually, have something to celebrate. The team may be as woeful as ever but, their ballpark, Wrigley Field, which has amazing stories to tell, will reach an historic mark. Wrigley Field will celebrate 100 years in 2014. That’s quite an achievement. Beginning with “A is for an amazing ballpark, an address on Addison Street” to “Z is for Zachary Taylor Davis” each page is crammed with clever rhymes and intriguing details that will entertain and inform enthusiasts both young and old. Herzog’s obvious keenness for his subject reveals the true feelings, win or lose, about Chicago baseball and it’s very special place in the hearts and minds of the fans who “bleed Cubbie blue.” The amazing illustrations by John Hanley cover every page and somehow manage to combine at the same time, a feeling of both dreamy nostalgia and up-to-the minute reality. Anyone who enjoys baseball will enjoy W is for Wrigley. If you’re a true Cubs fan, it will most likely find a hallowed place on your bedside table. Sweet dreams Cubs fans, next year will be your year. If you’re looking for a charming, fun, early chapter book for Halloween without the spook factor, you might consider conjuring up Jill Murphy’s The Worst Witch. The story takes place at Miss Cackle’s Academy for Witches, a boarding school where young witches learn to ride a broomstick, make potions, and craft spells. Mildred is a witch in her first term, and she is at the bottom of her class: the worst witch. But, as the reader learns, Mildred is kind and honorable and resourceful. And she also has a loyal best friend, Maud. So even though Mildred’s spells turn out all wrong, and even though her smug classmate Ethel seems out to get her, and the severe Miss Hardbroom has no patience for her mistakes, and everyone thinks Mildred singlehandedly ruined the school’s Hallowe’en performance, it all turns out alright in the end. This is a sweet school story that just happens to take place at an academy for witches. It is a good choice for readers transitioning into chapter books, or for older readers just looking for a quick read. The Worst Witch is the first in a series of books that take place at Miss Cackle’s. And, if the premise sounds a bit familiar, please do note that The Worst Witch was published in 1974! 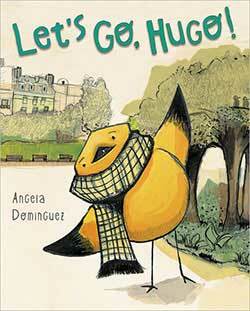 Little Hugo is a bird who lives in Paris, and he LOVES his life filled with art and friends and fun. There is just one problem — Little Hugo is afraid to fly! Hugo has somehow found a way to walk everywhere he goes; and he could just keep on walking, except for the fact he has met a new friend Lulu. Lulu LOVES to fly, and she wants to show her new friend Hugo the most amazing building called the Eiffel Tower; and of course, she wants to fly there. Hugo and Lulu spend the day together having loads of fun together eating popcorn, playing in the fountain, and all the while Hugo keeps creating diversions in order to keep himself planted firmly on the ground. When Lulu finally needs to go home for the day, Hugo is afraid he will never see his new friend again, and so he decides to try to face his fears! His wise friend owl helps him along, and when Lulu comes back, she manages to convince Hugo that she too can help him to fly, even if he is a little scared. I love the message that if you take a chance, life can be a beautiful adventure (especially if you have a friend to help you when you get a little scared). This is a message that is good for children and adults as well. I’ve always loved the Gossie series of books by Oliver Dunrea, and I now enjoy sharing them with my son. In this seasonal title, the feathered friends are dressed in adorable costumes and are ready for some Halloween fun and scaring. They’re busy prowling around the farm, hooting like owls, and enjoying treats. When Halloween night gets a little too scary, they run back to the barn for the last pile of treats. This is another sweet story in the series that even includes a lesson about sharing!